The Producer Co-ops were one of the first kinds of Cooperatives developed to explore and provide solutions to the farmers’ production in the early 1880. Producers Co-ops are also known as marketing co-op where the members provide the co-op with the same production that the co-op markets in a processed or value-added form. The Co-ops’ mandate is to commercialize the members input by seeking the best price possible on the market. In Manitoba many groups of suppliers are organized into marketing co-ops to meet the marketing requirement and to explore and access the market for their product. These Producer Co-ops include farmers, artists, harvesters and fishers seeking out and selling to end users to earn and retain the benefit of their owners/producers. 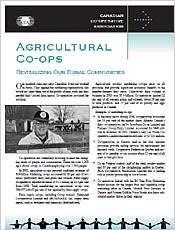 For more information please read about Agricultural Co-ops in this article by the Canadian Cooperative Association (PDF).